We often hear about the next big thing in stem cell therapy, though few of these promises eventuate or are backed up by evidence. Well, we think we’re close to a genuine breakthrough in stem cell therapy, based on new research published today in Proceedings of the National Academy of Sciences. We have developed a stem cell technique capable of regenerating any human tissue damaged by injury, disease or ageing. The new technique, which reprograms bone and fat cells into induced multipotent stem cells (iMS), has successfully repaired bones and muscles in mice. Human trials are set to begin next year. 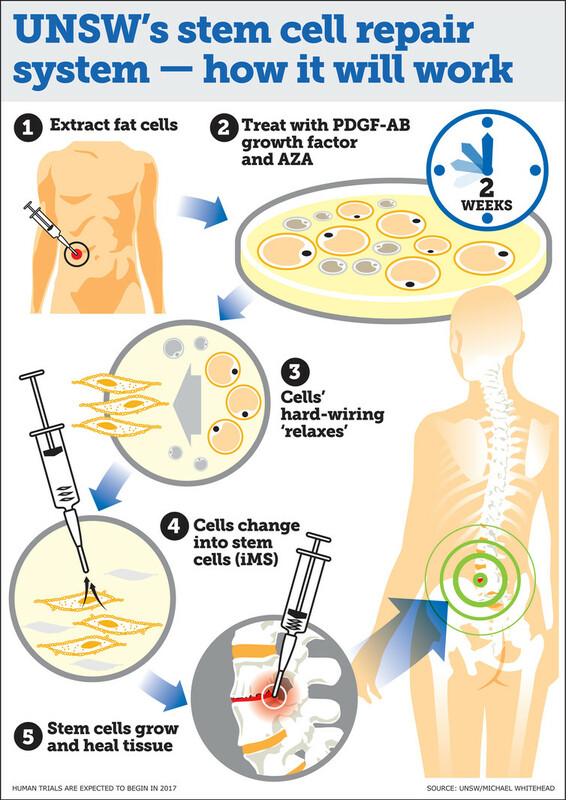 Injecting stem cells to repair damaged tissue is not a new concept. Every time someone receives a bone marrow transplant, they have in fact received blood stem cells to rescue their blood production. But bone marrow is easy to extract and blood is constantly replaced. Therefore, blood stem cells are relatively easy to source. This is not the case if you need stem cells to repair damage to muscles, cartilage or organs such as the heart and brain. These stem cells are not easy to extract and their turnover is low. If stem cells are hard to extract, another option is to reprogram mature cells from other parts of the body that are relatively easy to extract. We have developed a method that converts fat or bone cells, which are relatively easy to extract, into induced multipotent stem cells. This method involves culturing fat or bone cells with a drug called Azacitidine and a naturally occurring growth factor called platelet-derived growth factor. Azacitidine is used to treat blood disorders and has the ability to relax the hard-wired gene expression patterns that make a fat cell a fat cell or a bone cell a bone cell. We think the combination of erasing the cell’s memory with Azacitidine and forcing the cell to proliferate with the growth factor are key to converting fat and bone cells into induced multipotent stem cells. The new technique is similar to the limb regeneration of the salamander, which can repair multiple tissue types, depending on which body part needs replacing. In 2006, Japanese Nobel Prize-winning stem cell researcher Shinya Yamanaka identified a small number of genes that could reprogram skin cells from mice into immature stem cells, which could grow into all types of cells in the body. However, these induced pluripotent stem (iPS) cells, like embryonic stem cells, which are derived from early embryos, are not suitable as a stem cell therapy because they can form tumours rather than repairing damaged tissue. Since then, scientists have identified different combinations of genes that can reprogram skin or other cells into tissue-specific stem cells that only make cells of a single type of tissue. A drawback with these reprogramming methods is the use of viral elements to force gene expression. Researchers use a virus as a mechanism to inject the gene into the cell. Multipotent stem cells, in contrast, are produced without using any viral elements. They can regenerate damaged tissues without making unwanted tissues or tumours at the site of transplantation. We have reprogrammed mouse bone cells into induced multipotent stem cells and injected these cells into mice with damaged bone and muscle. We were astounded by the ability of these induced multipotent stem cells to regenerate these damaged tissues and also generate their own blood supply to carry nutrients to these developing tissues. The transplanted cells appear to follow instructions from adjacent cells and divide and mature in an orderly fashion. We are still investigating the safety and regenerative potential of human-induced multipotent stem cells. We have injected human-induced multipotent stem cells, made by reprogramming human fat cells, into our animal models of tissue injury. We are monitoring signals from these cells and know they are retained at the site of injection. In a few months, we will retrieve tissues from these mice to measure the contribution from transplanted human-induced multipotent stem cells to tissue regeneration in mice. We need evidence of robust tissue regeneration and the absence of any unwanted tissues or tumours at these sites before commencing human trials. The process of human induced multipotent stem cell production is free of animal products and is being developed to meet manufacturing standards appropriate for human cell transplantation. Our initial clinical focus will be using induced multipotent stem cells either as a stand-alone treatment or with spinal implants to treat degenerative disc disease towards the end of 2017. Low back and neck pain is frequently associated with degenerative disc disease and is a major cause of disability, affecting millions of people globally with crippling physical and economic costs. Our aim is to use induced multipotent stem cells to regenerate discs to retain the flexibility of the native spine or to stabilise spinal implants by helping them fuse with adjacent bone. We need further research to understand how mouse- and human-induced multipotent stem cells respond to signals from damaged tissues. It will also be important know how long induced multipotent stem cells remain at sites of transplantation and retain their ability to proliferate and make new tissues. Nevertheless, this efficient virus-free method of generating tissue regenerative stem cells brings us a step closer to realising stem cell therapy for repairing tissue injury in the human body. John Pimanda is Associate Professor of Medicine and Stem Cell Biology at UNSW Australia. Ralph Mobbs is a neurosurgeon at the Prince of Wales Hospital, and Conjoint Lecturer at UNSW Australia. Vashe Chandrakanthan is a Researcher in regenerative medicine at UNSW Australia. This article was originally published on The Conversation.